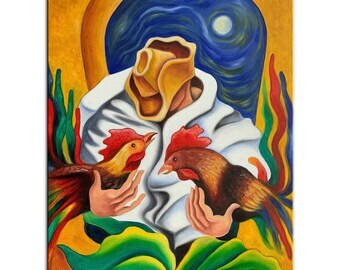 ORIGINAL HANDMADE OIL PAINTING ON STRETCHED CANVAS. READY TO HANG. CUSTOM MADE TO ORDER. Signed and dated on the front and on the back by me (Dixie Miguez) the artist. Custom hand painted to order. This is a recreation of a piece which was already sold. Its not an identical copy, it's a recreation of an old subject. This recreation will have brush strokes unique just to this painting, a fingerprint that can never be repeated. My recreation will look similar but not 100% identical, each brush stroke is unique and impossible to repeat. Each painting I create is one of a kind. MEDIUM: Professional quality brand Oil Paints. Varnished. SUPPORT: Professional quality Artist Canvas stretched on 1.5 inch wooden stretcher bars. CANVAS EDGES: Painted Black. With staples on the back. ORIGINAL: YES, original, one-of-kind, Handmade, unique, NOT a PRINT! This is a custom made order. It will take about 10-15 days to complete the order before it could ship. I will send you a notification with pictures as soon as the painting is ready prior to shipment. Since this is a handmade painting, it will be very similar to the original picture but not 100% identical. If you have any questions regarding this item or for shipping information, please e-mail me. In context mages showing the painting in a room and/or framed, are for illustration only and may not be exactly to scale. Please refer to the published dimensions to ensure this painting is a perfect fit for your space. Copyright worldwide is owned by the artist, Dixie Miguez. Please note that this is a custom-made order just for you. This item is not in stock, it will be produced (hand painted) for you after your order is confirmed. Since this item will be created just for you and, since there is a production cost involved on it, I cannot accept return, cancellations or exchange and/or offer refund on this custom order. Please make sure that you choose the correct painting and size before you place your custom order. Please contact me if there are any problems with your order. If the product arrived damaged by the shipping company, refuse receiving and/or if it is on your possession take pictures of the damaged package or content and contact me for replacement instructions. Thank you for your understanding! My painting came in earlier than expected and well packaged. It was easy to contact Miguez and have all my questions answered regarding the size and ordering procedure. I absolutely love the painting, colors and artistry. We loved Miguez’s whimsical art and knew the coffee on sunflowers painting would look great in our above the dining table. Miguez was quick and responsive and sent us updates. He also changed the painting a little like we asked. The painting is just as imagined - vibrant with beautiful shading and colors. It was packaged very safely and carefully and arrived in excellent condition. We are eyeing one more painting of his for the bedroom! This isn't the actual painting. This was just a design to give me an idea. The real painting is beautiful. I will try to post it later. Very pleased. 24"x36" Framed Original Oil Painting on stretched canvas. Custom Order. 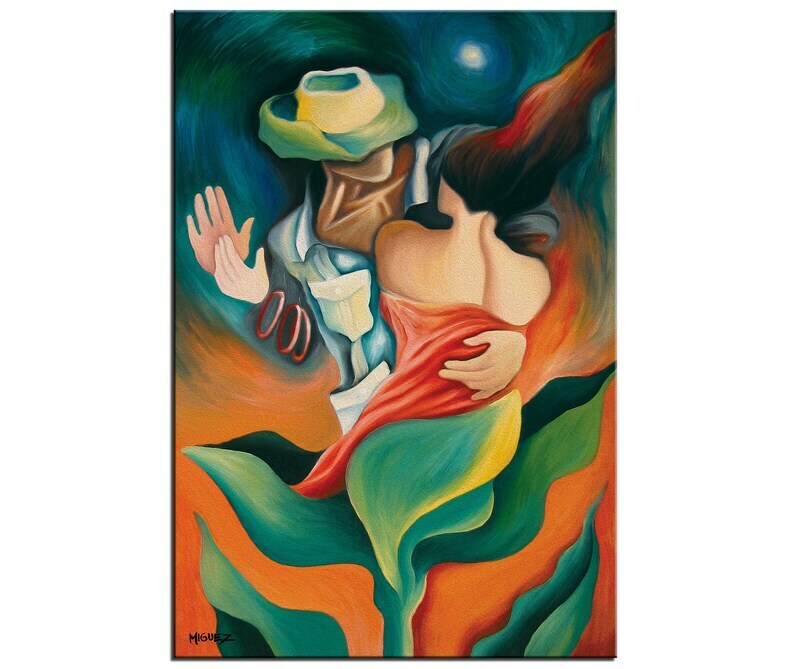 Dixie Miguez's colorful, romantic oil painting, "Piano Guajiro", is a wonderful artwork. Dixie communicated with me to show the progress of the painting, drying time and shipping information. I appreciate Dixie's efforts to keep me informed and the artwork arrived as scheduled. I had the stretched canvas oil painting framed with a satin black frame with a thin gold fillet inset and it looks beautiful in my home. I highly recommend this talented artist.